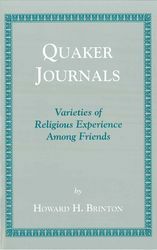 For over three centuries Quakers have used the spiritual journal to record their spiritual life and journeys. Some, especially those of famous Friends, were published; others lay in attics or on the shelves of libraries. Here Brinton looks on them as a whole class for the first time, stressing the importance of examining the original unedited texts. He shows the reality of Quaker ideals and testimonies as actually lived by Friends through the ages.